So How Did Zack Greinke End Up On The Diamondbacks? The Los Angeles Dodgers are a remarkable experiment in what happens when you take the financial brakes off a team and see how far you can fly with pure spending. On the field, their ethos is pretty simple: get men on base and hit homers on offense, then strike people out when they have the ball. Last year they had the most dingers and walks in the NL, the second-most strikeouts in the NL, and they got all the way to the NLDS. If not for Daniel Murphy’s historical dong-stroking run, they may have made the World Series. Obviously, they’ll want to get there next year. But they don’t build their team with an eye on a consistency and cohesion from the draft up or anything. They use the gravity of their deep roster of very rich owners to draw in stars, whoever they may be. This hasn’t always worked out, but having a payroll above $300 million has gotten them to the playoffs consistently this decade. And this strategy—while theoretically an unfuckupable, free-market-leaning one—has its downsides the same way any team-building methodology does. L.A. gave freshly-defected Cuban third baseman Hector Olivera a $28 million signing bonus, then promptly traded him before he ever took the field. That lump sum is a kind of sunk cost, the exorbitant slush that you have to live with losing when you want to remain fluid while handing out minor fortunes. Which is all to say it’s curious that they didn’t pay up for Zach Greinke. The former Cy Young winner just turned 32, and he’ll be 37 when his 6-year, $206 million deal with the Diamondbacks expires. Paying upwards of $30 million for a 36-year-old pitcher (a notoriously fragile species of athlete) is a very risky prospect, but that’s exactly the type of risk that the Dodgers and their galactic spending are set up to mitigate. L.A. apparently thought they could get away with a slightly smaller, shorter offer. It’s worth negotiating from a lower number, but when every free agent knows you have a cavalcade of rich owners who always pay up, you’ve kneecapped your own leverage. The Diamondbacks just recently came into an extra $1.5 billion in a new TV deal, as well as an ownership stake in Fox Sports Arizona, so that influx of cash is probably why they were emboldened to beat the Dodgers at their own game. They have the money, the same way the Giants did. But investing in Greinke to this degree is a bigger risk for them, which is why he always made more sense as a Dodger. After all, the sneaky benefit of L.A.’s apparent ocean of capital isn’t to go sign the very best two or three baseball players, it’s to be able to take the most chances. Greinke might be dominant for the length of his contract. He’ll probably be dominant next year. Sports are full of uncertainty, but the Dodgers have the rare ability to mitigate some. 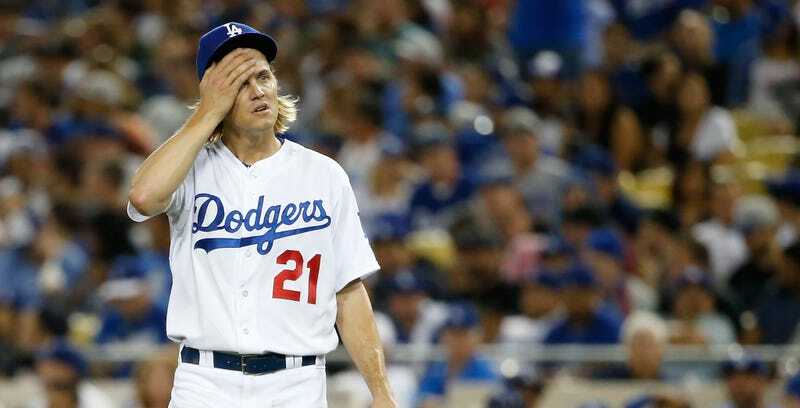 Letting Greinke walk sure seems like the kind of move Andrew Friedman and Farhan Zaidi were used to making, or rather, not making, with other teams. How they balance this more discerning approach with the typical bombast of managing the Dodgers pocketbook remains to be seen, but it looks like that means something different than unchecked purchasing.